It’s time to look at a survival film which mainly takes place in a large forest. It definitely goes to show why it’s such a tough task to take care of these places since people are always trying to go in there and try to live on the land. The authorities in this film are actually super lenient all things considered as I could easily see the main characters getting jail time for what they try to do. At the very least, that’s what I would picture Will’s fate would be. It’s an interesting film that’s pretty low key and is more of a down to Earth story than many other movies. It can be a bit on the tragic side as well though. The movie starts with Will and his daughter Tom living in the forest. At first you wonder why they are there. Has there been a zombie apocalypse? Vampires running loose? No. It turns out that Will doesn’t like humanity so he has decided that the only way to enjoy life is to live outside without any other souls around. Even if the characters are alone they can’t live in a house unless it is one that Will found first and no humans have lent him. This is a rough lifestyle for Tom, but she does her best to get by. The cops eventually catch the two and Tom gets a glimpse of what life would be like with a warm bed and food. Still, Will isn’t satisfied so he tells her that they have to evade the cops and head back to the forest. Tom is reluctant to do this. Can they really survive under such a lifestyle? Well, she’s about to find out! While you might not mind Will for a few minutes, you’ll probably know almost right away that something is off about this scenario. Why are the main characters living in the woods? Before the film reveals that Will is basically crazy you assume that maybe the zombie apocalypse came early or something like that. No, Will just doesn’t like to live like the average person and that’s when the sympathy for his character ends. You’re just waiting for Tom to try and escape him the whole time. It still makes for a pretty mysterious beginning though. I’ve never been a fan of camping so living outside for any prolonged period of time would definitely be pretty rough. It also doesn’t make for the most engaging of films typically but fortunately this movie doesn’t let itself get bogged down in the details. We don’t see them eating insects or anything like that. That’s when the film would have crossed the line. While I can’t say that I liked Will, Tom’s a good character. She is trying her best to adapt to the situations she is put in and does so without a fuss. She is young enough where it is believable that she is following Will’s bad advice as well. You can’t really fault her for not trying harder to distance herself since that’s not really an option. By the end of the film she also makes the right call. Without Tom doing her best to help Will get used to the new lifestyle the whole thing probably would have been even tougher on the main characters. It’s also a pretty interesting look at how the rangers prevent people like this from living in the forest. It’s certainly not a job I would envy as it seems extremely difficult so I hope they are compensated well. The forests are huge so you can imagine how tough it is to constantly be surveying it. The guard dog certainly did good as well. I’m not sure if this is how it works in real life with how the organization tries to re-locate these people, but if so then it is a much more generous process then I would have ever imagined. Rather then go to jail they give Will and Tom a fairly nice house and a whole lot of freedom. They have so much freedom in fact that I’m not sure if this is even a good idea. Of course the characters aren’t bad people in this case, but I do think this could have gotten very wrong. Of course it still isn’t enough to make Will happy, but it was a nice attempt by the agency. Even the tests they gave the main characters weren’t invasive in the slightest while still being a little effective. I’m not really sure I buy into how they really think you can understand someone through vague questions, but I know there is some science to it. The film is certainly a slow burner though so you’ll need to appreciate the landscapes and atmosphere here. A good chunk of the story is the characters walking through the forest and doing their best to come to terms with the elements. The landscapes look pretty nice though and it’s definitely a forest that I would be up for visiting. I’m still more of a “lounge by the hotel” kind of guy, but it’s a good change of pace. Basically all of the human characters who show up are nice which is fortunate for the main characters since the situation could have gone sideways pretty quick. Characters like the truck driver were pretty reasonable and all of the dogs in the film were a blast. Again, pretty much every character aside from Will is solid so that’s definitely a good thing. Overall, Leave No Trace is a pretty decent film. It can definitely be a little tragic at times as you feel bad for the rescue workers who are just doing their best. Naturally it can also be pretty tough for Tom the whole time. Fortunately the film always stays pretty tame and doesn’t let the situation get too absurdly bad for the main characters. It’s never a film that’s hard to watch. At most you’ll probably just get frustrated with Will the whole time which is intentional on the film’s part. Beyond that, it’s a pretty unique film and one that is probably informative as I imagine it is likely pretty realistic. These kind of films usually have a good basis in fact with the writer doing some research before the film comes out. 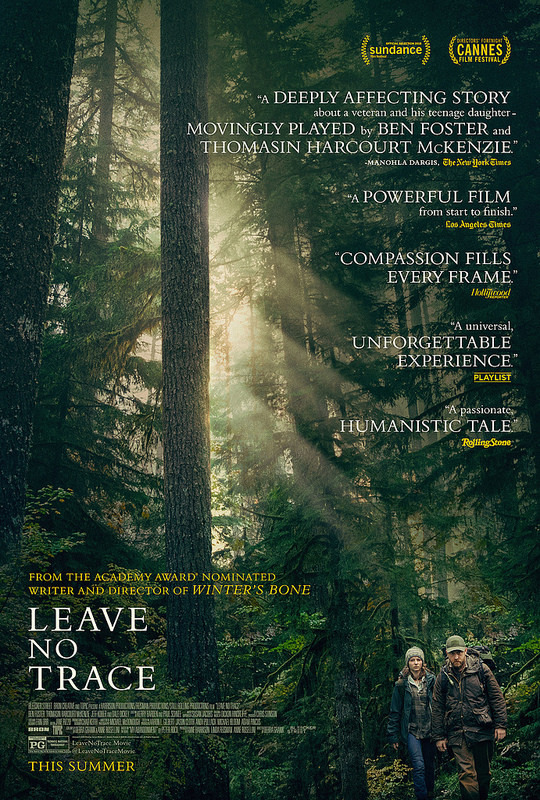 If you want to see a film about how you could possibly survive in the forest (As long as you have a ton of money. Will is conveniently loaded so he can constantly buy whatever they need) and why it is not as good as just living in a house then this is the one for you. This entry was posted in Live Action Movie Reviews, Live Action Movies, Reviews and tagged Drama, Film Review, Leave No Trace, Movie Review, Review, Survival, Suspense by dreager1. Bookmark the permalink.